This astrolabe was made for Queen Elizabeth I. It is one of four known by Thomas Gemini, who moved to England from the Low Countries. The rete pattern is typically Flemish, and on the back is engraved an 'astrolabum catholicum' of the type designed by Gemma Frisius. On the plate are also engraved later dedications, showing that the astrolabe was given to the University of Oxford for the use of the Savilian Professors, by Nicholas Greaves. This, together with other instruments exhibited in the Museum of the History of Science in Oxford, was acquired by John Greaves, Nicholas' brother and Savilian Professor of Astronomy, for his scientific journey in Levant in 1637-40. 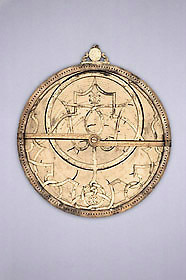 The astrolabe was possibly used for observations made by John Greaves to determine the latitude at Rhodes.